A top House Democrat to whom billionaire liberal Tom Steyer has donated campaign funds steered more than a billion dollars to an infrastructure project that benefitted his hedge fund. That hedge fund, Farallon Capital Management, bought up large plots of real estate in San Francisco’s burgeoning Mission Bay neighborhood in 2004. The area is now booming and Farallon has sold most of its property there. Steyer, who founded and led Farallon until late 2012, has used his fortune to elect Democratic senators and governors. He has pledged to spend $50 million of his own money in 2014 and to raise another $50 million. Among the beneficiaries of his political largesse is House Minority Leader Nancy Pelosi (D., Calif.). ""We want to support Nancy as much as we can," Steyer said in an interview last year. Pelosi, who did not respond to requests for comment, has also supported Steyer, though with less fanfare. Over the past decade, she has steered federal subsidies to a light rail project designed to stimulate commercial and residential growth in Mission Bay. Experts say the project swelled real estate values in the area. "From a decrepit and seemingly abandoned old rail yard 15 years ago, Mission Bay has sprouted into San Francisco’s fastest-growing neighborhood," the San Francisco Business Times reported last year. One of the beneficiaries has been Farallon, which bought two million square feet of Mission Bay commercial real estate space and a handful of residential properties in a $343 million deal in 2004. "This is a world-class asset," said Richard Fried, at the time a managing member at Farallon. "We see it every day. When we had the chance to buy, we jumped at it." Farallon created two entities for the project. FOCIL-MB bought the land and development rights, and Mission Bay Development Group handled the construction and development. Costs associated with the latter were reimbursed by the city of San Francisco under a public-private partnership agreement. The San Francisco Redevelopment Agency reimbursed Farallon using funds raised through bond sales financed by tax hikes in the city. By 2013, Farallon had sold all but two of its parcels at Mission Bay. The fund would not say whether it realized a gain on its sold properties, what that gain was, or whether it has plans to sell its remaining two. By last year, Pelosi had steered more than a billion dollars in federal financing to San Francisco’s Third Street light rail project, which provided Mission Bay with previously unavailable public transit access. The bulk of that financing came in 2012, months before Steyer gave up day-to-day control at Farallon (he remains invested in Farallon funds). Pelosi announced that she had helped secure $967 million to expand San Francisco’s Central Subway system. "With nearly $130 million from the Recovery Act and $18 million from across the federal government, the project will use public investments to spur and stimulate the private sector; adding jobs and creating a better environment for business," Pelosi said in a statement announcing the funding. Her support was more than just financial. Pelosi went out of her way to expedite federal backing for the project in the face of bureaucratic hurdles designed to ensure responsible stewardship of taxpayer funds. A 2005 San Francisco Municipal Transportation Agency analysis of the Third Street light rail expansion found that the project would be wasteful and inefficient. "As proposed, this project … promises to combine high capital costs with higher operating costs and … does not, apparently, effectively meet the market needs in the corridor it is intended to serve," found Thomas Matoff, the former director of transit planning for the city who led the study. That finding posed a problem for the project, which was required to meet Federal Transit Authority standards for cost-effectiveness in order to secure federal subsidies. Pelosi got the project an exemption from those standards in a 2005 transportation funding bill. Despite projected inefficiencies, the project was expected to stimulate real estate prices in the surrounding area, even if it did so through de facto taxpayer subsidies. In 2003, a year before Farallon bought up its significant Mission Bay real estate, engineering and design firm Parsons Brinckerhoff extolled the benefits of public transit projects for surrounding property values. "The research shows that for both commercial and residential development, values become greater as properties are closer to a light rail station—the closer the higher the value," stated the report, which examined Mission Bay as a potential beneficiary of such programs. Expanded Third Street Light Rail access would "serve as a catalyst for new development" in Mission Bay, the report predicted. By the time Pelosi secured the bulk of federal support for the light rail project, Mission Bay was seeing some of the fastest-growing real estate values in the city. But the 2012 round of subsidies was just the latest in her long campaign to secure funds for the project. That advocacy began before Farallon bought its Mission Bay properties. In 2003, Pelosi secured $11.5 million for projects related to the light rail line. The following year, Farallon bought its Mission Bay properties and the pork continued to flow. Pelosi earmarked $11.7 million for the light rail project in 2008, bragging in a news release that she had "secured more than $40 million dollars" for the project by that time. She earmarked another $10 million in 2009, and $6 million in 2010, according to legislative research service LegiStorm. That year, "Mission Bay" began to show up in Farallon’s lobbying disclosure reports. The fund was already paying powerhouse Washington, D.C. firm Holland & Knight to conduct government relations on its behalf. Since October 2011, disclosure reports show, Farallon has lobbied on nothing but Mission Bay. 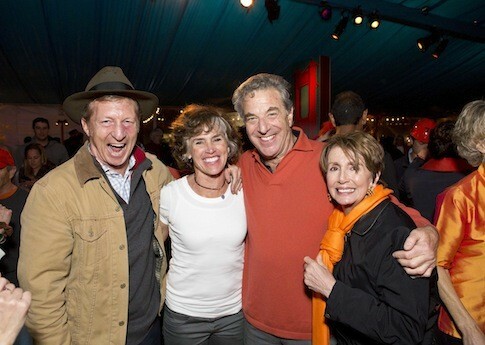 By the time Pelosi had secured nearly a billion dollars for the light rail project, Farallon had paid H&K $150,000 to lobby Congress and the Department of Transportation on Mission Bay. It has paid the firm another $150,000 since then. It filed a termination notice on that contract last week. As H&K was lobbying, Steyer was donating. In February 2011, he maxed out to Pelosi, writing her two $2,500 checks. The next year, she earmarked another $10 million. The $967 million came just months later. Steyer ended up donating more than $100,000 to Democrats during the 2012 election cycle. He and Pelosi also personally met around that time. They and their spouses were photographed together at a January 22, 2012, gala at the San Francisco Ballet, and at a May 27, 2012, celebration of the 75th anniversary of the Golden Gate Bridge. Farallon did not respond to questions about whether its chief executive’s political sway contributed to its assessment of the value of its Mission Bay properties. A spokesman did say that the fund "had no role" in securing federal support for the light rail project. Steyer maintains that his political activism is rooted purely in ideology—"ideas and principles that we think are incredibly important," as he said in a recent interview. But critics say the Mission Bay deal points to a willingness to use his considerable clout in Washington to advance his own interests. Similar charges were leveled against Steyer when it was reported that Farallon owned stakes in competitors to the company behind the Keystone pipeline, which Steyer vehemently opposes. He "lined his hypocrite billionaire pockets with our tax dollars," said Phil Kerpen, president of the conservative group American Commitment, which has criticized Steyer’s support for leading Democrats. This entry was posted in Politics and tagged Democratic Donors, Government Spending, Nancy Pelosi, Tom Steyer. Bookmark the permalink.